President Trump proposed a replacement for retiring Justice Anthony Kennedy. Here, the best reporting to date on the Supreme Court nominee. President Trump on Monday night nominated Judge Brett Kavanaugh to the seat on the U.S. Supreme Court that Justice Anthony Kennedy will vacate at the end of the month. Kavanaugh is a judge on the powerful U.S. Court of Appeals for the D.C. Circuit. Below, we’ve gathered some of the best reporting on Kavanaugh. Did we miss anything? Leave a link in the comments or tweet to us with #scotusnominee. 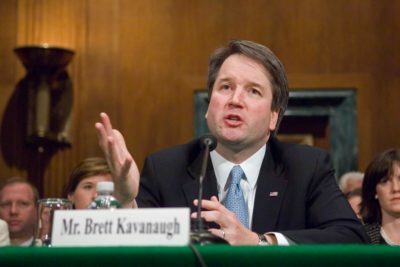 SCOTUSblog’s profile of Kavanaugh provides a comprehensive summary of the judge’s background, from his upbringing in the Washington area to his college and law school years at Yale to his prestigious positions in various parts of the federal government. As the profile notes, Kavanaugh was a law clerk for Kennedy, whom he has been nominated to replace. The piece offers a highlight reel of Kavanaugh’s time on the federal appeals court in Washington. Ultimately, the article concludes, Kavanaugh “brings a pragmatic approach to judging,” albeit with a serious conservative bent. Kavanaugh’s nomination “presents a band of government archivists and White House officials with a herculean task: wading through what could be millions of pages of records” ahead of his confirmation hearings. The paper trail leads back to the two years Kavanaugh spent in Bush’s White House Counsel’s Office and another three years he spent as Bush’s staff secretary. Politico’s Josh Gerstein takes a look at how the extensive documentation of Kavanaugh’s executive branch career could slow the judge’s confirmation process. FiveThirtyEight draws on a tool to measure judicial ideology developed by legal scholars and political scientists to assess Kavanaugh’s potential effect on the Supreme Court’s jurisprudential makeup. The conclusion: a Justice Kavanaugh “would likely represent a reliably conservative voice and vote on the high court”—“to the right of Gorsuch and Justice Samuel Alito, and just to the left of the arch conservative Justice Clarence Thomas.” That would leave Chief Justice John Roberts as the “new median justice.” FiveThirtyEight adds a caveat, however, about the metric it’s relying on: it’s based on the ideology of the politicians who nominated a judge—in this case, Bush—rather than the judge’s rulings. In this comment, Jeffrey Toobin describes Kavanaugh as a judge in thrall to partisan politics. Toobin characterizes Kavanaugh’s work as an appeals judge as “startling.” He accuses Kavanaugh of “pandering to the base” in a dissenting opinion he wrote in a case challenging Obamacare. Kavanaugh “appeared to offer some advice to the Republicans who are challenging Obama in the election,” Toobin wrote — whatever courts hold, a Republican president could simply decline to enforce the health-care law because he deems it unconstitutional. The Washington Post’s Robert Acosta and Josh Dawsey survey conservative misgivings about Kavanaugh’s record on the federal appeals court in Washington. Where Toobin saw Kavanaugh as a right-wing partisan, many social conservatives fear he’s not enough of a hardliner. The conservative response to the White House floating Kavanaugh’s name included “a clamor from those who see him as out of step on health care and abortion, or too tied to George W. Bush’s White House.” The concerns arise from opinions Kavanaugh wrote in cases challenging the Affordable Care Act and in a recent case over the right of an immigrant teenager in federal custody to have an abortion. The judge dissented in those cases, but did not go as far as “ideological purists” would have liked. Update, July 10, 2018: This story has been updated to include additional links.